What’s wonderful about this DIY Deodorant is that it’s super easy to make and IT WORKS! At the end of the day I take the old whiff test [yup] and I’m still smelling fresh! 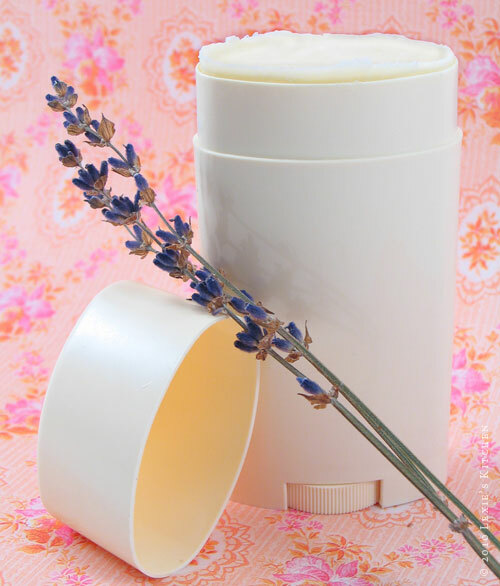 Today I’ve got a recipe for homemade deodorant that I am crazy about. It comes from Amy Karol at The Angry Chicken. Amy is one creative talent. Be sure to check her out. The deodorants I have used (Tom’s of Maine and Kiss My Face) have worked so-so. On sweltering days I admit to resorting to my husband’s trusty Old Spice (shhh, and again, more chemicals). Thankfully, I think my Old Spice days are over! My friend, Jane, turned me on to The Angry Chicken and Amy’s dynamite deodorant recipe. What’s wonderful about it is that it’s super easy to make and IT WORKS! At the end of the day I take the old whiff test [yup] and I’m still smelling fresh! I made a half a batch of this recipe. Once the mixture cooled to a thick and creamy consistency, I twisted the empty stick dial all the way down, filled the void with the deodorant mixture, capped it and placed it in the freezer to harden. When I removed it from the freezer I carefully ran it under warm water until the dial twisted up and down freely. I hope you’ll give this one a go! Just be sure to store it in a cool place (not in your gym bag in a hot car!). Visit The Angry Chicken for all the how-to’s. Amy’s recipe calls for cornstarch—which I did not have—so I used tapioca starch. Mmmhhmm, and no, it did not give me puddin’ pits. I would have used arrowroot starch but I was out of that, too. Oh and heat the mixture on the stove top, NOT in a microwave. Trust me on this one. Seven ingredients to avoid in products that you apply to your skin. *Dr. Mercola seems to have a product for everything and wants you to buy it. He is a marketing genius—taking the educate-your-customer approach to selling. He has a lot of good things to say and research to back up his claims. He’s worth checking out. I am so not kidding that i just said to my husband that I was going to start making my own deodorant! My old chemical-free stuff has just not been cutting it in this 100+ heat lately! I am TOTALLY going to make this (I will keep you posted)!!! Hi Lexie! This is the first time visiting your blog and I am tickled about the idea of making homemade (safe) deodorant! I love this kind of stuff and have begun to make my own body scrubs (pretty much using the same ingredients in different proportions). Thank you so much for sharing this and I look forward to being a regular reader of your blog and meeting you at the IFBC in August! Hi there Heidi! Yes, I look forward to IFBC!!! So I have been using this deodorant for almost 2 weeks and it is still working. Even spent 4 hours hoeing (how on earth do you spell that?) at the farm and still no BO. 🙂 I could use a muscle ache bath salt soak, though. Maybe you could whip me up some! Love your site, too! Hey girl – And now I love you even more (who knew that was possible!). They only ingredient I don’t have is cocoa butter – but I’ll get some and try this! You’re so funny Lexi. I’m glad to see the deodorant passed the ho test. HAHA! Couldn’t resist. I might hitch hike to IFBC so I can see you and Heidi. This is really cool! I’m sending the link to my sister – who relies on me to pass on all cool blog posts. Hey, storing it in the fridge might be the way to go especially during the dog days of summer. What a great idea. Both my husband and I are so sensitive to deodorants, we can’t even use most of the natural ones. This will be great to try. I’ll let you know how it goes. I found your site through Kim at Cook It Allergy Free. I love finding new blogs to read. I can’t wait to check the rest of yours out. This is an interesting idea, I started using Tom's because I loved the smell of it and like that it was all natural. When I am out of that one, I will definitely try this out. It seems like it will work plus doesn't making your own stuff end up being cheaper in the long run? I tried this last night…was out of Shea Butter, so I used a little extra cocoa butter…might seem obvious, but it didn't work 🙂 It got too hard…I didn't have an old dispenser, so I just put it in a pot, and no go. It might would be ok in a dispenser if you rubbed and rubbed! Jocelyn … It got super hard because cocoa butter is rock hard when cool. Shea butter remains fairly soft at room temp. Don't throw it out, just get more shea butter and when you do, remelt what you have and add the amount of shea butter plus some. No shea butter? Then try more coconut oil. For this recipe, proportions are important : ) Trust me, I ran into the same thing making lip gloss and used way too much bee's wax and I practically ripped of my lower lip trying to apply it. Thanks for the idea! I have used baking soda with amazing success, but after a while it started irritating my skin, so its time to try something new! My friend sent me a link to this post a few months ago… we went in together on the ingredients and I *finally* had a chance to make a batch last week – I LOVE IT! Thanks for posting a "little something unexpected!" Hi. Can't wait to try this! How does it fair as an antiperspirant? I so just posted this on my blog! Sounds like a great idea and I am looking forward to trying this! Thank you. I'm allergic to cocoa butter. What can I substitute for it? I have been thinking about making my own deodorant and came across this link through a post on The Nourished Life. I already make a skin lotion for myself and my boys with some of these ingredients. I love how it makes our skin feel. I can't wait to try this deodorant recipe! I tried this recipe last night because I wanted a deodorant without bees wax. I noticed the bees wax was leaving a yellow, waxy residue on my clothes. My finished product last night doesn't go on smoothly. It kinda crumbles, comes off clumpy. Any sugestions?